Bhagalpuri Silk Sarees is most popular indian sari all over the globe. I have seen the huge demands of Silk fabric saree in India compared to other sarees like Georgette, chiffon and Net fabric . Today in this post I want to share some facts about queen of all silk sarees ” Bhagapuri Silk saree “ ) So keep reading till end. 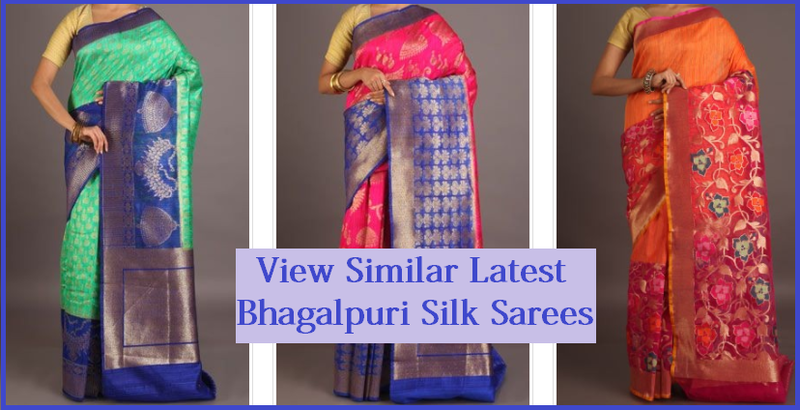 I will share how much it cost to have bhagalpuri silk saree, where you can purchase, weight of the saree and much more. So keep reading and don’t forget to share your thoughts in comments. From where Pure Bhagalpuri Silk Sarees Come? From the research and wikipedia information I come to know that Bhagalpuri silk sari was designed and created almost 200 years ago. Wow! its crazy a old trend is back it to the market. Well, the origin of Bhagalpuri silk sarees is was started from the small town of bihar known as Bhagalpur which is situated on the southern banks of river Ganga. Bhagalpuri sarees is also famous as tussar silk sarees. When it comes to weight they are famous as lightweight sarees and easy to wear and provide great comfort. Bhagalpuri sari is designed with classic pallus that provide unique look to the saree. How Bhagalpuri Silk Saree Manufactured? All most original and pure bhagalpuri silk saree is hand printed. It is designed with natural vegetable dyes to give a natural color to sari. This make it different from the other art silk sarees. Well many of us thinks that cost of purchasing bhagalpuri silk saree is higher, but this is not true. I have seen many website offering pure bhagalpuri silk sari With a price range of Rs 5000/- to Rs 15000/. You can easily buy Bhagalpuri silk sarees online by just knowing trust and quality of website. You can check website like cbazaar, utsavfashion, G3fashion, Amazon India, pothys and more. Let me know in comments that what type of silk saree you preferred for wedding?